I have a headache and feel powerless. I try to open my eyes but strong light makes me close my eyes again. I wait for a minute and barely manage to open my eyes. I can see bright light. I am in somebody's room and now get up on my hands. The room is seen in detail. The blackish iron bars of the door are seen first. I look around the room with the temples of my head pressed. Somebody made the room neat. A sheet of memo is found. "You waisted your time" "You are extremely guilty of it but I will give you a change." "It is not difficult. You must show me your strong will for your life." I don't know who made this trap but I walk up to the door. The door is locked. It will not open. 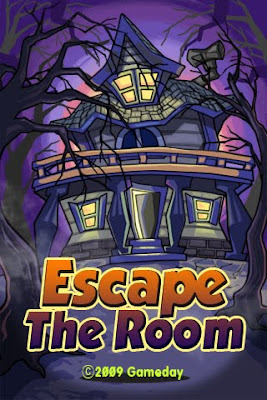 of the game20 detailed rooms are provided with each stage.Thanks to various designs of tools used in the real life, the game player can enjoy realistic game play.The purpose of developing the game, Escape The RoomThe game, Escaping from the room, is the best escape i-phone game.Special designs are created especially for the game of escaping the room.Various games are played in the combination of over 50 kinds of items.There are about 20 various rooms.Continuous game play is possible thanks to hidden items.This game is good for the i-phone game as it is possible to play in a brief time. Neither can I!! I've been trying for 2days!!! The bottom draw is locked I thought that might have something to do with it?? It's driving me nuts! I'm ready to delete with no rating. 3 strikes and your out, and something about keep your eye on the ball, its like the amount of tries u have left. and the s and b no idea what that is?? Stuck in room 3. Def need a walkthrough. What's the code for the safe in room 3? I've tried everything. fyi, baseball code needs assumption basically. you should find out 3 numbers which are also arranged in order. 1 strike means you got one right number in the right place. 1 ball means you got one right number but you put it in the wrong place. for example, the code is 369.
but your assumption is 306.
when you look into the sentence over the fireplace. I found it...what did you do with the triangle puzzle in room 9? I'm also stuck in room 3. I have the lighter, but the wood is too wet to burn. Room 3 how do I mix water and explosive? Help appreciated with the code in room nine! Thanks. Kay, use the hammer on the walls, and then use lit candle. When it goes out use the hammer there twice, that should open the other room of this level. Stuck on room 4, iv opened the safe in the first room, n I have batteries but no idea wa to do nxt! Plz can sum1 point me in da right direction?!? Kay how are you stuck in room four when you've been to room five? In any case look at the note from the painting and think mirror. Different Kay!! Soz onli realised after I posted it. Thanks for help!!! i cant get the 2 room.. dont know were is the pc... any walkthrough? Code for safe in room 4?? In room three, break apart the camera, put film in fireplace, and get lighter from woodpile. Please anyone knows the code for safe in room 4? ?i dont get this with mirror. Courtney, any luck with room nine? I'm stuck after finding all the medals. How do you figure out the triangle code? Stuck in room 4. Tried using code backwards but didn't work and amnow lost as to how to get that safe open. Any suggestions? how do you use the mirror idea with the note in room five? I've been stuck on room 9 for days. Help greatly appreciated with the triangle code. How do you open the window in room 6? Pls help me get out of room 1. HELP! I'm stuck! Still can't figure out the safe in room 4, please I neeeeed help, I did the painting code in mirror image and all and still can't get it!!! Ok. I got the keys. How do I get under the table? Where's the backpack? Hey what keys? Can someone just write the code?the one on note is 6614.room 4.Pleeeeaseee!!! I am stuck in room 3. I've lit the fire, opened the safe and I think found everything there is to find but I can't figure out the sodium and water. I've tried combining them and placing each in every possible area of the room. What am I missing? tamceeo1 - separate the keys. Anyone have any success with the room 9 code? Put the sodium in the capsule, Michelle. Michelle, combine the capsule and sodium, then the water. Place it by the wall, then the hammer will open another room. Dear stuck in room nine club, does anyone think the laser can be moved? This has by far been the hardest room; I've been stuck three days. I'm gonna email Nate Games. I'll post any help. The code for the safe in room 4 is the hint LOSE upsidedown. Need help in room 7...I have used the magnifying glass on the door and laid the poster in front of it...I combined the wire and the magnet,now I'm stuck. I've tried moving laser. Doesntw work. What do you do with cola? ItsKris separate the wire and magnet. Courtney, I still have no idea what to do with cola. Second safe level 4 room 2??? I tried 6614 every way possible and LOSE upside down???? can someone please give me the answer? I feel so dumb! Lisa: LOSE upsidedown is 3507. Ha! I was using 1. Thanks!! Out of one room, and stuck in the next...can I get a hint on what am I supposed to do with the wall clock in room 8? I can't find anywhere to use it or the ruler, and I already have the code from CDs. Kris, you have to go into separate and double tap the clock. Then put the numbers according to the cd code into the spaces on the floor (#1 goes into the spot next to the button). Anyone have any info on getting the code for Room 9? I tried to do that, but it won't separate...am I supposed to do something with the ruler first? Ok you have to take the ruler and stick it under the metal shelf and you'll get the key to the tool box. Once you open the tool box you get a screwdriver. COMBINE the screwdriver and the clock. i'm stuck in room six. I have the tape, hammer, wet pipe and vaulve. Nothing i try to do works. What do i do? Hopie: put the tape right over the blue piece behind the window an use the hammer. I'm also stuck in the basement of 5 and cant figure out where to find the code. Can anyone give a hint? Room five has a piece if chalk in the spiderweb, combine that with the knife and use it on the door. The dust will stick to the keys you need to push. Stuck in room 9. I cAnt get the medal between the bookshelf and the cabinet. Help appreciated. @Matt&Krista use tape on inflatable thing, put that in between the cabinet and bookshelf, then use pump to inflate it. Ok so has anyone actually cracked room nines code? Okay, I've gotten 3 medals in room 9. Is there a fourth and if so, how do I obtain it? Thanks! Now I just have to figure out this impossible code. This coke bottle has to be used for something... gah. So I emailed Nategames for room nine help, no answer yet. Shouldn't they be checking this page and realize everyone is stuck? I like this game so much, but am frustrated by lack of guidance by the developers. Room nine; I've even tried the individual items like tape and blade and hammer in different spots before you combine them for the medals. I also had the medal box as something to place, anyone tried that and got success? oh my room nine. i was trying to just type in every combo possible but it took forever just to get to 1200. so i calculated how many combos are possible. 10,000! :/ answer must be in there somewhere. oh and i started at 1100. not one. i'm not that crazy. in room 9, you gotta obtain all 5 medals and arrange them correctly. with the triangle puzzle, you should count all the triangles. I'm still confused... the code for Room 9 is larger than 50 and smaller than 60? I typed in every code between those numbers and it's still not working.. Please HELP! Yeah room 9 still makes no sense. If anyone figures it out, please post answer. I think they mean higher than 60 but lower than 70... Just throwing it out there..
Room 9, triangle problem tried all numbers from 50 - 60. Doesn't work. help please.. Thanks! Now at level 13.. anyone know what to do after u put the colors in the right order? I only have a lighter and that note now.. Is there something else I should be able to pick up? Cassie: Did you get the key out of the locker on the wall next to the colors? It opens when you have the colors in the right order. How did you find the code for room 10? You need the magnet from the second room and wire from the plant in the first. Combine them and use them in the fire place. Then combine the rusty plate and the toothpaste. I'm in 13, now. Does something happen after the colors are right? The locker on the wall will open. in room 10 I'm past the code, but now I'm stuck. i extinguished the fire. I don't know what to do with the wax and memory card. I separated the magnet and the wire, then combined the wire and the wax, but can't seem to find a place to use it. Help?! Kaycee use the magnet and wire in fireplace, you'll fish something out. I need some help with room 8... Got the clock, don't know what it's for.. The CD's do morse code but don't know what that means.. Help please. kaycee, if you haven't extinguished the fire don't. Place the wire with wax attatched in the fire. Wax will melt leaving you the key to the trunk which you should separate from the wire to use. 4 keys and a locked door; what do I need to do to escape?? Love the game, but, it equvalent to a brain freeze!! Koko.. Use the box-cutter on the black canvis in the middle of the wall, then use the hammer on the brick, use the key that you get from the wall on the small silver door in the bottom right corner of the room.. "S" means you have a number right and in the right spot.. "B" means you have a number right but in the wrong spot. Tim, use the magnifying glass on the walls. I'm stuck in room 11. I have the red key card but can't figure out how to find the code for the safe. Michelle, can you give me a little more than that? I had already found the list of the coding on the wall? Tim, the code is on the cork board. Tim: put the CDs into the computer, and figure out which number they correspond to. It' been a few days since I did this, but it should help you figure out which numbers you need to fill each slit in the floor. I'm stuck on room six =/ I have no idea how to get 4kg with a 5kg cup and a 3kg cup >< help! Thank you very much for your interest in 'Escape the Room'. We didn't expect the tremendous popularity in this mathematical problem. We will avoid that describe the problem because that is Mathematical formula. Instead of providing a very simple clue. But we want to try counting yourself. We're very sorry that we noticed wrong answer. Code for room 9 is 0064. then, combine the key and soda.. This will leave you with 1kg in the 3kg cup. Pour the left over 1kg of water from the 3kg cup into the 5kg cup. Fill up the 3kg cup again, and empty it into the 5kg cup. Stick it in the freezer, close the freezer. Reopen it then separate the ice and the cup. place the ice in the weight. For room 10, get the screwdriver out of the locker I think, then use it to open the blue case above the door. Soo room 10, I've put out the flames with the extinguisher, now what do i do? ive combined the wax and the wire and can't find a place to use it. Thanks Kaycee. What do I do with the card, wax, magnet and wire? Kaycee leave through the fireplace! Ok so I'm in room three of part 13, I have a tennis ball, glue, etc. I'm doing my best to figure it out, small hints appreciated. Thanks Suzanne . Now i'm stuck in room 11. Any clues? I was thinking about that, why I never tried it, I'm not sure. Thanks MMF! I am in part two of room 13, the balance took my 10L bottle with 5L water, then i am stuck.. anyone can help? Does anyone know the code to the safe in room 11? the diary said A PRESENT FROM SANTA. I can not figure out the color combo??? Any help?? thanks hope. moving on to room 12! What to do in second area in room 13? I have 3 beakers, glue and a lighter. place it in the ash pit. You will then obtain the red card. help on 13 please - have a 5kg weight on the scale ? also wheres the tennis balls? Another one for room 13. Scale "took" my weight, now I only have the 7 and 3 liter glasses. No tennis ball...can't find it. Stuck. In room 5. I am having a horrible time with the hammer game. Can't seem to keep the yellow bar in the right place. Is it my Iphone? Stuck in room 3. What do i do with the cheese? I cant figure out room 2! i have a hammer and two keys. I've tried hammering every spot on the walls with no luck! Any help would be great! Starryeyes u need 2 5kg weights- & it's possible with 3 & 7 liter bottles. Good luck:). These roomies r great !! Without Tim's help on level 2 I wouldn't of finished. Koko, where did you find the box cutter in level 2?? Thanks for any help! charlie, its a bit weird but the only way i can do the hammer game is to make sure the bar is as close as possible to the bottom, click on it and when the yellow bits start to break away on the hammer, quickly tap on the other icon. I'm really at my breaking point:) ahhh! How do i get through room 2? i've tried everything i can think of. If it tells me 'theres nothing important here' one more time, I'm DONE! Koko...well looks like im the crazy one:) thank you! Need help with Room 8! My clock won't separate. How do I get in the toolbox or do I need to? I need help with the bottles in room 13. please help, i'm going crazy!!! How do you finish the 3rd section of room 13? I have the tennis ball with the glue, a lighter,bread and magnifying glass. help please! Combine glue & tennis ball then put it in the air pipe in the 2nd room and pull the handle. After that I have no clue!! Let me know if u figure it out!!! Room 8 help pls :)? Nevermind. Figured it out! Yay! Stuck in 2nd room of Room 13. Had 5L in 10L bottle on scale...was using my magnifying glass and hovered over the 10L bottle and it's completely gone. Got 5L in 7L bottle...put on scale and was using the lighter and the same thing happened with the 7L bottle...so now all I have is a lighter and a 3L bottle. Should I start over? Any ideas? Everybody, figure out room 13!! Combine glue & tennis ball, put it in the air pipe in the 2nd room and pull the handle. After that use the magnifying glass and put it in the broken area where you use the tennis, do this for several times, and then you'll get a diamond on the floor, just near the broken pipe, use the diamond in the 3rd room on the glass wall, ESCAPE! Stuck in room 12. I have collected 6 notes, are there more? I can't figure out the code. I know I'm over thinking this, the answer is probably really simple. what do you do after you get the valve out of the mirror in room 6? I love this game!!! So fun and frustrating at the same time. ESCAPE THE ROOM!!! i really need some help with room 6 and am about ready to throw my ipod out the window. i have the valve out of the broken mirror but what's next? How do I get the code for the safe in room 10???? Ok wait. I'm a little farther but I'm still stuck, I got the key to the toolbox from underneath the shelf, and I opened the toolbox and got the screwdriver and used it on the clock and got the roman numerals. I don't kno wwhat to do now though! Help? Is it morse code or something? Cause if it is I DEFINITELY won't figure it out lol. i really need help with 13! i put the 5L of water on the scale but nothing happend! I am so frusterted! Please help am stuck in room 12. Have all the notes but I'm totally stumped to what the code is. Can someone help please? Nvm...I just looked up and saw what someone had put in as their code and it worked for me too. Now I'm stuck on Room 12. I have all six notes and I've done the equations (A=1;B=40;C=8;D=40;E=48;F=4272). How do I figure out the code to get out? I tried putting in F but it doesn't work, and the code is four digits. Adding them together doesn't work, neither does subtraction... someone help? Ugh! Room 7! My poster is on the floor by the door. I've tried using the magnet and wire separate and together. Broke the mirror, nothing happened. Looked in the lock and lost my magnifier. It says "use this!" by the cardboard--tried both magnifying glasses, but I don't see anything. I feel so dumb! What am I supposed to do??? Sean: put the tape over the blue thing in the window then use your hammer, you'll get a key and that will let you go to the second part of the room... if you figure that part out let me know so I can move forward. we uploaded videos of game cheat to youtube. we will continuously upload the next videos. Corey: for second room of room six first you grab the five and three liter cups, then attach the pipe to the pipe on the back wall and add on the valve to the grooved area then tap valve to turn on water. then fill up 5 liter cup with water then combine with 3 liter. then dump 3 liter in the bucket with the mop. then combine cups again. then fill up the 5 liter and combine with 3 liter. then place 5 liter in freezer and close and open then get cup out separate the ice and cup and place ice on the pedestal in front of door and you are out. How to make 5kg with 3L 10L and 7L??????? where is the tennis ball in room 13?? Fill 10L, combine 10L with empty 7L, empty 7L, combine 10L with 7L leaving 3L in 10L bottle, fill 7L, combine 7L with empty 3L, empty 3L, combine 7L with empty 3L leaving 1L in 7L bottle, combine 7L bottle (1L) with 10L bottle (3L) to make 4L, repeat steps with 3L and 7L bottles to get 1L again, to make 5L. I can't find th wire in level 11! Can someone tell me where it is? Look through the most recent reviews of the app on iTunes--there is a walkthrough for room 3 there. oops, I meant that last post to be in response to your room 3 question. Need help with Room 13. I have managed to get 5l in 10L bottle. put it on scale. how do you get 5l out of 7l and 3L bottles??? I've also had issues with bottles disappearing. Someone lease help me out! !